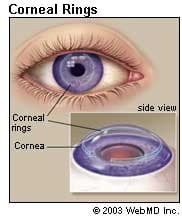 The cornea is your eye’s clear, protective outer layer. Along with the sclera (the white of your eye), it serves as a barrier against dirt, germs, and other things that can cause damage. Fun fact: Your cornea can also filter out some of the sun's ultraviolet light. But not much, so your best bet to keep it health is to wear a pair of wraparound sunglasses when you're outdoors. It also plays a key role in vision. As light enters your eye, it gets refracted, or bent, by the cornea’s curved edge. This helps determine how well your eye can focus on objects close-up and far away. If your cornea is damaged by disease, infection, or an injury, the resulting scars can affect your vision. They might block or distort light as it enters your eye. Epithelium. The outermost layer. It stops outside matter from getting into your eye. It also absorbs oxygen and nutrients from tears. Stroma. The middle and thickest layer lies behind the epithelium. It’s made up mostly of water and proteins that give it an elastic but solid form. Endothelium. This is a single layer of cells on the very back of the stroma. The aqueous humor, a clear fluid in the front chamber of your eye, is in constant contact with this layer. It works like a pump. The stroma absorbs excess liquid and the endothelium pulls it out. Without this function, the stroma would become waterlogged. Your cornea would get opaque and hazy, and so would your vision. The term corneal disease refers to many conditions that affect this part of your eye. These include infections, tissue breakdown, and other disorders you get from your parents. These symptoms also come with other eye problems, so they may signal a more serious issue that requires special treatment. If you have them, go to your eye doctor. What Conditions Can Cause Damage? Keratitis: This inflammation sometimes occurs after viruses, bacteria, or fungi get into the cornea. They can get in after an injury and cause infection, inflammation, and ulcers. If your contact lenses cause an eye injury, that, too, can lead to keratitis. Treatment usually includes antibiotic or antifungal eyedrops. Some people need antiviral drugs and steroid eyedrops. Ocular Herpes ( Herpes of the Eye): Like fever blisters, this viral infection can come back again and again. The main cause is the herpes simplex virus I (HSV I), the same one that leads to cold sores. It can also result from the sexually transmitted herpes simplex virus II (HSV II) that causes genital herpes. This condition creates sores on the cornea. Over time, the inflammation can spread deeper into your cornea and eye. There’s no cure, but you can often control it with antiviral drugs or steroid eyedrops. Herpes Zoster (Shingles): You can only get it if you had chickenpox. The itchy illness goes away, but the virus that causes it doesn’t leave your body. It stays in your nerves, but it isn’t active. Later in life, it can travel down those nerves and infect specific body parts like your eye. A shingles rash on the face can cause sores on your cornea. They usually heal by themselves, but antiviral medication and topical steroid eyedrops can ease inflammation. See your doctor if you have any symptoms. If you’re over 50, get the vaccine. Keratoconus : This disease thins your cornea and changes its shape. It usually starts blurring vision during teenage years and worsens during early adulthood. Changes to the cornea’s curvature can create mild to severe distortion, called astigmatism, and usually nearsightedness. The disease can also cause swelling, scars on your cornea, and vision loss. Your night vision could get so bad you can’t drive after dark. Eye diseases like retinitis pigmentosa, retinopathy of prematurity, and vernal keratoconjunctivitis, along with Down syndrome, osteogenesis imperfecta, Addison's disease, Leber's congenital amaurosis, and Ehlers-Danlos syndrome are associated with keratoconus. At first, glasses or soft contacts can solve the problem. As the disease goes on, you may need to wear rigid gas permeable lenses. For people with early keratoconus, a procedure called corneal crosslinking can be performed. During the procedure, the doctor instills riboflavin eyedrops and the eyes get exposure to small amounts of UV light. This procedure often prevents worsening of keratoconus and can prevent the need for corneal surgery. A small number of people with keratoconus will need a cornea transplant. During this procedure, the doctor will replace your damaged cornea with a donated one. This operation is usually successful. But you probably will still need glasses or contacts to see clearly. Map-dot-fingerprint dystrophy. This affects the back layer of your epithelium, which separates it from the stroma. It grows irregularly (thick in some places, thin in others). That causes irregularities in your cornea that look like maps, dots, and small fingerprints. It usually affects adults over 40. It’s usually painless, doesn’t affect your vision, and gets better without treatment. But sometimes the epithelial layer can get worn down and expose the nerves that line your cornea. That causes severe pain, especially when you wake up in the morning. It can also change your cornea's normal curve and cause astigmatism, nearsightedness, or farsightedness. Treatments include an eye patch, a soft contact lens "bandage," eyedrops, ointments, "tacking it down," or removing the loose layer. This is a minor procedure your doctor can do in her office. Fuchs' dystrophy: This inherited condition causes a slow breakdown of endothelial cells and the swelling of the cornea. This makes it harder to remove water from your stroma. Your eye swells and your vision gets worse. Haze and small blisters may appear on the surface. Signs of the disease may appear in your 30s or 40s, but it takes about 20 years for it to affect your vision. Women get it more often than men. An early sign: You wake up with blurred vision that slowly clears during the day. As the disease worsens, swelling becomes more consistent and vision stays blurry. Lattice dystrophy: This is abnormal protein fibers in the stroma. It can happen at any age, but early changes can be seen in childhood. It gets its name from the clear overlapping lines of proteins. They can make your cornea cloudy and reduce your vision. They could wear down your epithelial layer. Symptoms may go away with treatment, but over time you may need a corneal transplant. Results of this surgery are usually good, but the condition can come back. How Are Cornea Problems Diagnosed? You’ll need a thorough exam by an eye doctor. Follow strict hygiene guidelines if you wear contact lenses. Improper use is the main reason for developing corneal diseases. That will lower your chances of corneal infections related to their use. Don’t sleep with contact lenses in, even if they’re FDA approved for it. This habit greatly raises your risk of cornea infections. You can’t prevent diseases that you get from your parents (like dystrophies). But you can hang onto your vision if you find and treat them early.